Today is my 25th birthday, woohoo! Being the pessimist realist that I am, every single morning that I open my eyes I say a quick “thanks for letting me see another day, God!” Every single birthday I celebrate, I am elated to have spent another wonderful year on this earth. After all, it was 2 years ago that I spent my birthday in the Emergency Room due to an allergic reaction. Eleven years ago, I came remarkably close to leaving this earth before seeing my 16th birthday. I am grateful for life. This past year has been a roller coaster for me. I went through therapy, dealt with some really tough issues in my immediate family, resolved issues in family, “graduated” from therapy, got engaged, paid off debt, helped deliver a baby, gained a nephew, and defined several relationships in my life. This year I made it a point to stop living my life for other people and take care of myself. It feels good. Sometimes you have to realize that when somebody is destructive and continuously hurtful in your life, they need to be removed. No matter how much you love someone, you can’t let his or her actions affect your own happiness and well-being. It is hard but I have finally managed to say hey Courtney, you are pretty awesome. You only deserve to be involved in relationships that are healthy and safe. You deserve friends and family that will treat you with the amount of respect that you deserve. Phew, not an easy thing to do for a people-pleaser like myself. On a much lighter note, it is exactly one year until my wedding! In 365-ish days I will commit to spend the rest of my life with someone, I cannot wait. Sometimes I listen to the song we have picked out for our wedding march and get teary-eyed just envisioning our wedding day. I will try on my first wedding dress and burst into tears (happy ones of course). I will try on my first wedding dress and not feel anything. After all, it is just a dress. I will rip a dress while trying it on. Isaac tells me I have the grace of a newborn horse that has just been thrown into a swimming pool. I will find my DREAM dress, and it will cost my entire wedding budget. This is a possibility, since our engagement ring shopping kind of went this way. Every ring I pointed to in the glass case turned out to be around 10 grand. Finally I told the lady STOP LETTING ME TRY ON RINGS THAT ARE THAT EXPENSIVE! Isaac looked like he was going to vomit. I will hate every dress I try on. Does that ever happen to people? I will want every dress that I try on. Okay, I think that sums it up. So yes, I’m nervous. I’m enjoying the nervousness/anticipation though. It is the only time in my life (hopefully) that I will get to experience emotions specific to wedding dress shopping. Thank you to each one of my friends, family members, and followers that has made this day so special for me. 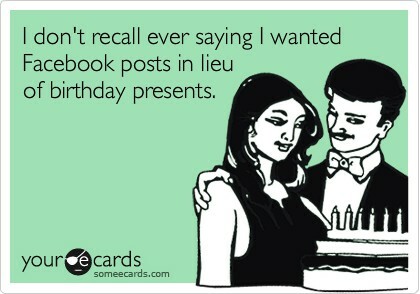 I am overwhelmed by the Facebook posts, texts, voice mails, and the wishes I have received today. Man, why can’t every day be like this? It has been such a good reminder of the amazing people in my life! 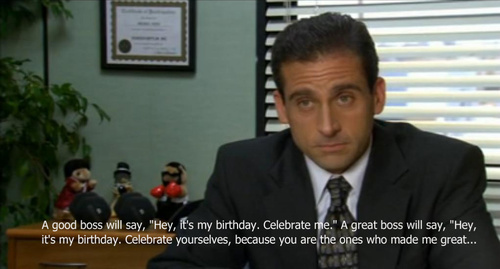 Tonight I will celebrate by eating Chipotle with my fiance and watching the Michael Scott Birthday episode of The Office. LLLOOOOVVVEEE this! I am extremely excited for you to be another year older! It just means that you are wiser (which is obvious)! I cleared out the photos on my phone so there will be plenty of space for photos of wedding dresses! Wooohooo you are going to be the most beautiful bride! You have the perfect “bridal gown body” so be prepared to love all of them! Soooo happy for you! Happy Birthday my friend! I love you!